Planning a visit? You’ll want to know what’s new in Aruba. Guest blogger *Susan Campbell is a journalist who specializes in the Caribbean and the tropics. She is a frequent visitor to Aruba so we were delighted when she agreed to give us the scoop on everything new on the island! Over the years, the hub of tourist activity had migrated from downtown to what they call “the strip” that lines Palm Beach where the high-rise resorts are. Oranjestad was sorely in need of a facelift. What was once considered Main Street had become almost a ghost town, and local merchants were hurting. So the government went to work with a whole new vision. It took two years to complete, but now the new reimagined city boasts pedestrian-only walkways, free hop-on and hop-off eco trolleys, beautifully landscaped green spaces and revitalized neighborhoods that are attracting new businesses and new visitors. The vibe is fresh and exciting and new museums, cultural centers, large modern shops, a new linear park and exciting pop-up festivals are also adding to Oranjestad’s new allure. And the best way to explore the newly restored downtown and learn about its history and attractions is with Aruba Walking Tours-also a brand new company. Before tourism became the main driver of the economy, San Nicolas was the nexus of Aruba’s prosperity – a bustling refinery town until demand for oil to fuel the Allied Forces waned after World War II. Soon after, the little city on the sunrise side of the island spiraled into a slow decline. For many years, the only reason for visitors to make the trek was to see living museum Charlie’s Bar going into its 75th year of continuous operation. But today there’s a whole new happening there; and it’s very arty! Historically Aruba has predominately been a big box resort island but, lately the accommodation landscape has also been changing. Pioneering the shift was the lovely Boardwalk Small Hotel Aruba– a charming boutique stay now with its own beach access. The new Bubali Bliss is another unique abode secreted away in walking distance to the beach. Also new in is OceanZ- a 13-suite luxury lifestyle retreat. And Aruba’s recent historic move to be the first island in the Caribbean to partner with Air BNB also makes it much easier to find secret gems for the budget- minded like Hidden Eden Aruba. On the uber upscale front there’s Villa Royale Aruba – an insanely opulent three-story mansion that’s surprisingly affordable with a group since it sleeps up to 25 people! It’s VIP living to the max- with or without staff and services. But the most surprising yet very quiet arrival has been the island’s first Tahitian style over-water bungalows in Savaneta. The Old Man and the Sea– formerly a surfside dining spot has morphed into a true South Pacific style paradise. At present there are three beach villas and two overwater villas- each decorated with a unique touch by the artist owner. When the project is complete, there should be about a dozen overwater villas in all. The same owner also owns Casa Alistaire, a gorgeous stand alone waterfront villa nearby that sleeps up to 8 people with a wooden deck so large it’s like living on a boat! 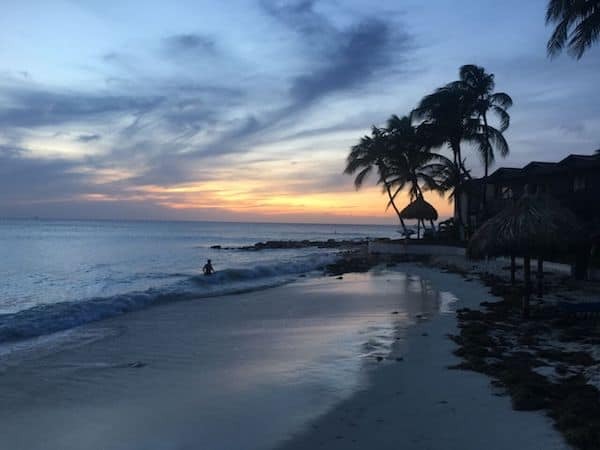 Legendary popular sister resorts Divi Aruba & Tamarijn All-Inclusives on Druif Beach-which connects to famous Eagle Beach- have lots of news, too. A brand new wing of 60 spacious rooms has just been built cresting brand new pools and a beach bar lounge. Also on site is authentic Mexican restaurant Pure Lime, and Tamarijn has thoroughly modernized and upgraded their buffet, and moved their Palm Grill oceanside. There are also all kinds of new dining, bars, activities and attractions to seek out far beyond the beautiful beaches. And the iconic landmark the California Lighthouse has also been renovated and is now open to the public for tours. For more about Aruba visit the Aruba Tourism Authority. Note: Another evolutionary move: For the good of the environment, as of Jan, 1st, 2017, Aruba has banned all plastic bags from retail outlets; you must bring your own reusable bag. Disclosure: Susan’s visits to Aruba were sponsored by the Aruba Tourism Authority and various island properties but any opinions expressed in this post are her own. Wonderful topic! I haven’t got the chance to read it full yet, will def come back to read this! The new reimagined Oranjestad sounds like a fun place to visit now – it\’s nice to have a \”real\” town to explore when on holidays. It\’s good news too that smaller boutique resorts have sprung up. That adds to the charm of a place. Not everyone wants to stay at big, brand-name, cookie-cookie resorts :-). We might have to visit Aruba again in future! Beautiful… Really beautiful. I never been in aruba but this post makes me happy to have a view of aruba in pictures. Sompe place don’t need to visit… They can make people happy with their experience. Oranjestad offers a new image for all tourists who want to visit the beautiful island of Aruba, I think it’s great, and that attracts many more people. I hope to be able to go again this year and verify the new structures; Luckily, I stay in residences near all the tourist spots, it’s called Harbor House (www.harbourhousearuba.com), it was definitely a good investment. On the other hand, it should be interesting to see the mural project of aruba, that surely adds a unique touch to that island. Thanks for the info!